Of celebrity chefs and their restaurants. Australia has quite a few of their own celebrity chefs too and famous restaurants. Thinking back, it’s a real pity we didn’t make a greater effort to venture out more then. In hindsight now, these Sydney restaurants are miles cheaper than the equivalent here in London, like half the price really. But I’m now getting used to the pound, the concept of the pound and the spending of the pound. So I’m doing less conversion. And anyway, it’s depressing doing the conversion now. Soon celebrity restaurants here in London will be as cheap as Sydney. Sigh….. Anyway, enough about the pound. … So, I don’t have too many celebrity favourites. Really, I have only one that I look forward to, and that is Jamie Oliver. And the reason why I like him is that his show and his cooking is really down to earth. I like it that if I follow his recipes (which often are pretty simple and easily substitutable), it tastes pretty good. This is aside from the fact that try as I might, I can never seem to “pile” the food to make it look restaurant-like. Nevertheless, like I say, it all looks the same in the stomach. I also respect him for the difference he has tried to make in social issues in England, using cooking as a conversation. Now I don’t know too much about what it was like here, but I’ve learnt enough on my own and I know that beef is pretty awful here, they sell a lot of pre-prepared foods here, caged eggs and my most recent in-depth learning, mechanically retrieved meat. Anyway, suffice it to say, we are pretty spoiled in Australia. My son’s school has a canteen and a chef that cooks hot meals everyday, and none of that pies, sausage rolls and chips stuff. So even by Australian standards, this is pretty neat. And I’m told, by other parents in the school, that it really came out of Jamie’s School Dinners TV shows. Pretty neat stuff. Jamie Oliver is not just my favourite celebrity chef, he’s the entire family’s favourite celebrity chef. Of course, one of our family’s goals here in UK, is to go to his restaurant. We made it to his nearest restaurant a few weeks ago when our son was at Hindleap Warren. 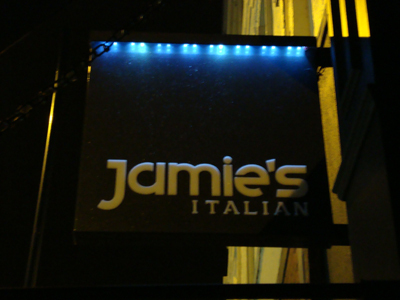 Conveniently located (for us) in Kingston, Jamie’s Italian has a very friendly rustic feel about it. What I don’t like about it is that you can’t book a table. Like everything else in England, you then just have to time yourself, hope you got your timing right, or wait in the queue. During the evening we went, we had to queue for about 20 minutes, which wasn’t too bad especially since it wasn’t raining. Would be worse if it was. As diners, we are pretty functional. We don’t do the cocktail before dinner, appetiser, order a bottle of wine, order mains, side dish, salad, dessert and coffee thing. Sometimes when we go to a restaurant, I sometimes feel the waiter disapproving when we don’t order alll 3 courses. At Jamie’s Italian, no such thing. You can go in there and eat just dessert if you want. I think that’s pretty cool. Reminds me of the Italian restaurants in Fremantle, where you’d rock up for dessert and coffee. We kept our ordering very simple. The only thing I wanted (and it turns the same with hubby) is that piece of grilled rump that has been aged for 21 days. So poor has my experience of grilled steaks been in the UK (to say something is “ok” is really saying “it’s not that great”), that I even looked the waiter in the eye and asked him whether the steak is good. Of course they would say it is. Anyway, no fuss, he took our steak order, chips and salad order, drinks and he was off. We didn’t have to wait long for our meals. It was pretty fast actually. And the steak was really nice, juicy and tasty on the inside and nicely grilled on the outside. The surprise factor for us was the salad. We had ordered Gennaro’s winter salad, which had a mix of pumpkin (or was it sweet potato), raddicio and pinenuts (and other stuff). Anyway, it was very delish. So delish, I still think about the salad, sometimes. I have a general philosphy about service tips and I get irritated about it when I am in a country where there are award wages set, ie. not the US or Bali etc where it is just minimum wages. Besides, a restaurant, like any other business, should pay their staff accordingly to provide great service. and there should be visibility through their prices, not through the fine print. If restuarants are so free to add a “discretionary service charge” at the end of your meal, they should be free enough to put it in brights lights after the Menu heading “Please add 12.5% to each of the charge below.” Just an honesty thing. Also, when restaurants do that, the very last impression I am left with, in terms of experiences, is not “what great food” but “they’re not very upfront about the true cost of their meals”. And that’s my soap box for the minute. And yes, I know I can’t change the world, and many restaurants in London do this. But I don’t have to dine there, and yes I know they don’t care that I don’t dine there. Oh, by the way, we really want to go to Fifteen as well.